Two students sit in shame as they are caught wearing their distracting apparel. The students were not punished, but were judged severely by their peers. An anonymous student sparks controversy as she models her sock and sandal combination. As she passed by administrators, not a single one stopped her for her outfit. Throughout the history of public schools, the dress code policy has gone through a variety of revisions. 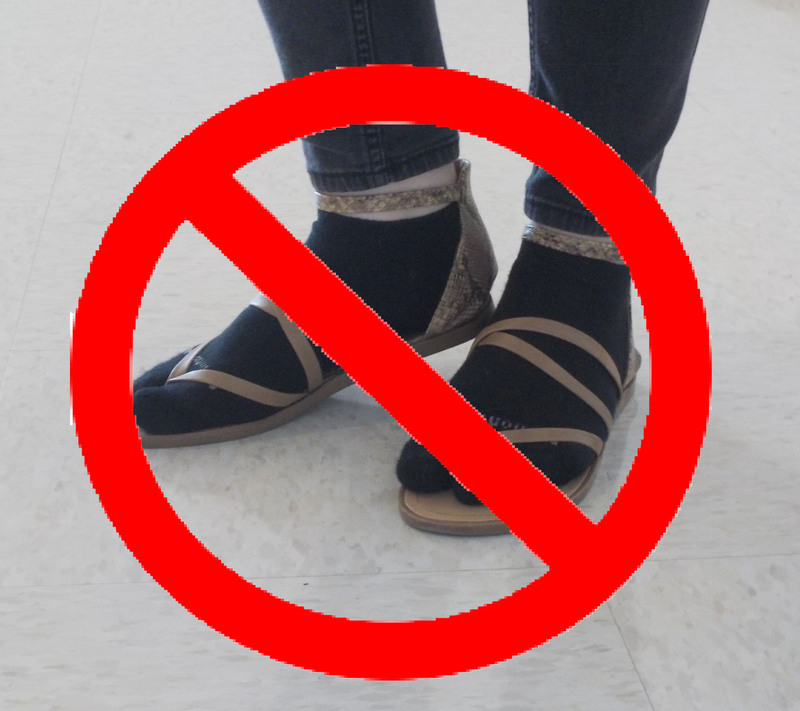 Because of this, students are now able to wear jeans and open-toed shoes, but nearly all can agree that there are some articles of clothing that should never be worn near a school, much less be strutted through the halls day in and day out. Our current dress code forbids students from wearing shirts that reveal the shoulders, but it does not forbid a recent fashion statement that has shaken the entirety of the school to its core. “It just doesn’t make sense. They look so much worse than shoulderless shirts,” sophomore Kristina Gosselin said. The dress code was originally put into place to prevent distractions among the student body, and this issue is causing a bigger ruckus than exposed shoulders could ever have managed. While shoulders can be easily covered, this worrisome wardrobe is nearly impossible to hide. Girls, in particular, have become more distracted by this look than boys ever were by shoulders. They can’t even bear to look down for fear of seeing such atrocious attire. “Looking down at people’s feet makes me want to gag. It’s disgusting,” freshman Hadassah Mattos said. This trend may even have played a part in the recent congestion in the hallways between classes, since students can’t even look at their classmates without fear of seeing this garish garment, leading them to flock together with their fashionably-responsible friends. It has become a challenge for students to move from class to class without running into someone who thinks that they are “rocking” this evil ensemble. “I just don’t get it. It defeats the point of sandals,” sophomore Elle Moller said. Not only does it prevent students from focusing on their academic pursuits, but the unsavory new trend has spread to the youngest members of the PBHS family: the freshmen. These naive, impressionable souls see seniors wearing these controversial outfits and immediately flock to stores to recreate that look, hoping to be considered “cool” by their peers. “If they (the freshmen) see a senior or upperclassman wearing socks and sandals, they might think it’s fashionable, but it’s really not,” junior Mikaela Whitmer said. To stop the further spread of this fashion disaster that threatens students, the school must destroy it at its source, yet administrators remain silent on this event. Students are outraged that they have done nothing to prevent the fashion felony. No matter what their age, grade, gender, or fashion style, everyone can agree that socks-and-sandals are revolting and have no place in this school.